1. You are going to write a letter to your university newspaper editor. And your letter should include the following points. You should write about 100 words on ANSWER SHEET 2. Do not sign your own name at the end of the letter. Use “Li Ming” instead. You do not need to write the address. As the growingly important role played by the Volunteers' Association in the university is concerned, I sincerely suggest that your newspaper should cover more on it. The Volunteers’ Association has been organizing various activities, which provide opportunities for the students to know more about the society out of campus. For instance, it organizes some students to teach English in some village schools; it holds meetings and forums for students to talk about serious social problems, such as Aids and poverty. In short, the volunteer activities have become a part of the campus life. 2) analyze the phenomenon and give your comment it. You should write about 160-200 words neatly on ANSWER SHEET 2. 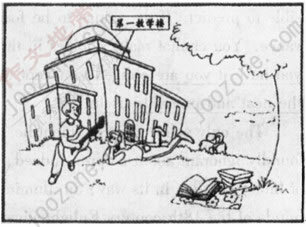 As is described in the picture, the boy and the girl who are in love are sitting on green ground or on long benches on campus. It is shown that love among college students has become increasingly common. What has made campus romance so popular? There may be several possible reasons for the increasing popularity of campus love. First, with the development of society, young boys and girls become more independent than before. They believe that they are mature enough to pursue their own love. Second, stress from study and competition among peers make quite a number of students try to seek relief from love. Moreover, peer influence may also be a contributing factor. If a student sees his classmates or friends with girlfriends, he may want to try himself. If he is left alone, he may feel ashamed. As far as I am concerned, there is nothing wrong with campus romance and no one can really ban it. What really counts is that college students should hold a reasonable attitude towards it. They should be aware that their personal relationships should not get in the way Of their study. They should keep their eyes wide open while trying to find a lifelong companion, otherwise the love will not last for long.